When we in the West think of people who take religious orders, we usually think of vows of poverty, self-denial, and a life devoted to prayer and contemplation. We don’t expect the religious life to foster one of the earliest truly remarkable writers of the Americas. It is doubly remarkable, considering the expected role of women in the 17th century, that the earliest recognized poet of the Americas was indeed a woman. By the end of the 17th century, the Viceroyalty of New Spain, centered in Mexico City, had established social customs and orders based on models of European monarchical societies. Like the upper classes in Spain, the Mexican elite delighted in displaying their status through portraiture. 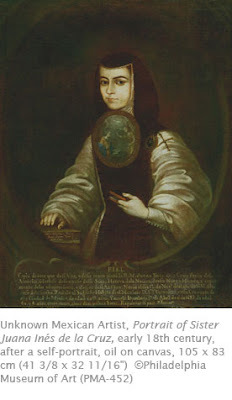 Juana Inez de la Cruz (1651–1699) entered a convent in Mexico City when she was 17 years old. Educated by her grandfather to read and write Latin and Spanish (he had an extensive library), she moved to live with a wealthy aunt in Mexico City in 1663. In 1664, she was presented at the court of the viceroy. Her wit and intellect made her a darling at court and she became a lady-in-waiting. Wishing to live alone to pursue education, she took on holy orders in 1668. She wrote poetry and music for the wealthy elite of Mexico, although she avoided any writings on theology until late in her life. She also wrote extensively on the benefits of educating women beyond what was customary at the time. Sor Juana’s cell was more akin to a modern apartment, with sitting room, kitchen, bedroom, and library. She also had servants. She received many noble visitors, including the Viceroy and his wife, and her cell became an intellectual center in Mexico City. Her status is reflected in her portrait. The style is in keeping with the contemporary Spanish Baroque of dramatic contrasts in light and dark to heighten the grandeur of the sitter. Her costly “habit” and jeweled pendant hanging from her sleeve indicate her family’s status, while the disk under her chin depicting the Annunciation to the Virgin Mary equate her vocation as a “bride of Christ.” The proud, direct stare at the viewer is typical of upper class Mexican portraiture, a reflection of the pride the sitters had in their rank and Spanish heritage. Click here to see the Dartmouth University Sor Juana project containing her literary works.